What is the future of knowledge? “In certain subjects, there is still a place for rote learning, as some concepts form building blocks for more complex concepts, such as learning verb constructions, but, generally, more emphasis is placed on the application and synthesis of given facts,” says Kim Davenport, Head of Life Orientation at Maris Stella. That said, “We can’t be preparing children for jobs that a machine will be able to do by the time they enter the workforce,” continues David Burns from Highbury. “A recent Oxford study shows that almost 50% of the jobs available in the US market today will have been replaced by machines in the next 20 years. We need to work hard to retain our humanity in this time when machine learning and artificial intelligence is becoming more and more prevalent. 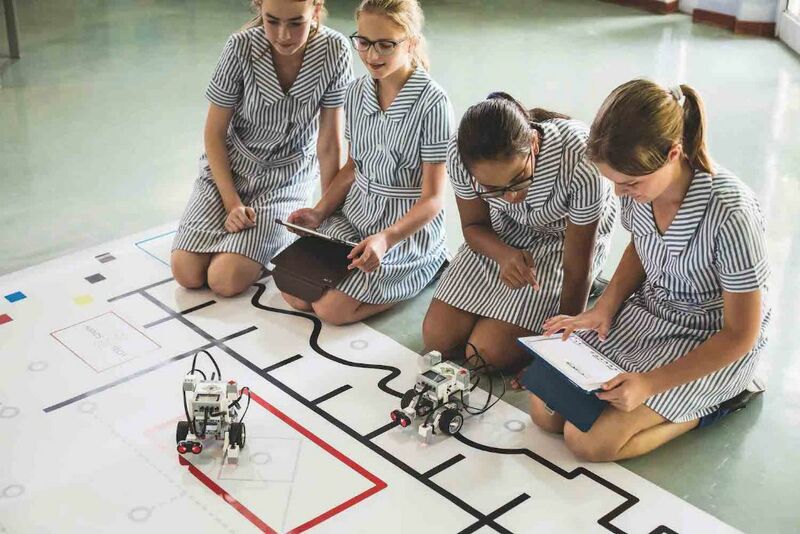 “At Durban Girls’ College, we have embarked on a Thinking Skills Journey that will empower our girls to develop explicit Thinking Skills, thus ensuring that learning is made more meaningful and enjoyable,” says Carol-Anne Conradie, Head of Junior Primary. “These skills allow girls to experiment with more resourceful and creative problem-solving techniques. “Our aim is to develop critical, creative and collaborative skills through a visible process and to encourage our girls to incorporate these capabilities across all areas of the school curriculum. Our focus is on process and not merely results, whilst establishing a growth mind-set. This ensures that all abilities are developed and allows for an all-inclusive engagement in learning. “It is our aim at St Mary’s to ensure that all the girls develop life skills that will inspire them to become remarkable young women in a world that is marred by distrust, inauthenticity and consumerism,” says St Mary’s Head of High School, Jo Kinsey. “The world is not the same as it was 10 years ago and, therefore, education and school cannot be the same either. “Education at St Mary’s is focused on teaching our students skills for the 21st century, using various forms of technology and media. We believe that all our girls need to develop these so that they will be successful individuals in their own chosen career. These skills are divided into three main components: learning skills, comprising critical thinking, creative thinking, collaboration and communication; literacy skills, comprising information literacy, media literacy and technology literacy; and life skills, comprising good EQ skills, social justice and leadership. “Kearsney’s number one priority is academic excellence and the College is committed to providing world-class facilities to support this drive. The Centenary Centre has been designed to create classrooms that facilitate modern teaching methodologies and the integration of effective teaching and learning technologies. Classrooms are large enough to provide a comfortable and conducive environment for formal lessons, as well as discussion groups and collaborative work, and also provide space for individuals to work on their own research,” Elwyn van den Aardweg continues. Hillcrest High School has embraced a blended learning approach and employs a full-time technology integrator. The school has been nominated as a Microsoft Showcase School and was identified by the Department of Basic Education (DBE) as one of three schools to pilot the national DBE Cloud Solution, largely due to its use of the Moodle Learning Management System. “We are continually looking at new ways to achieve a more relevant and future-oriented education system,” says Margaret Tracey, Technology Integrator. One such example is the IT Champion programme, which sees students support both teachers and their peers in the classroom as they make use of Moodle and to facilitate the paradigm shift that comes from blended learning. “Teachers often come out of very traditional methods and using the youth themselves – by the youth for the youth – has been a fruitful approach.” Margaret Tracey continues, “Through our involvement with Microsoft and the Microsoft Education Community, teachers have been able to train themselves and their own learners. This has enabled them to appreciate how powerful technology can be to take teaching beyond the classroom.